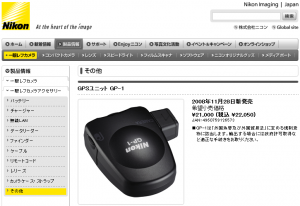 The Nikon GP-1 Geotagging GPS has been in the market for a while now even though it is still difficult to find one from reputable places. In case you are still debating if you want one, the Nikon GP-1 user manual may help answer some of your questions. Just a friendly warning if you are on a slow connection: the file is >10MB in size. It is not because the GP-1 is complicated, but because the manual contains translations of 20 different languages. The package contains both GP1-CA10 cable for cameras with 10-pin remote terminals (D3, D700, D300, D2X, D2XS, D2HS, D200), and GP1-CA90 for cameras with accessory terminals (D90). It also has GP1-CL1 strap adapter for attaching the GPS to camera strap instead of the hot-shoe. If you want to use remote shutter release when the GPS is attached, you will need to get the MC-DC2 remote cord. GP-1 does not have a on/off switch. It continues to receive GPS data even when the camera is turned-off. You need to unplug the cable connecting it to the camera to turn it off. Otherwise it will shut off after three hours of idle. When GP-1 is connected, the exposure meter on 2-series cameras (D2X, D2XS, D2HS, or D200) will not turn off unless you turn the camera off! D3, D700, D300, or D90 have a custom setting to turn the meter off (GPS>Auto meter off). Somehow the power to the GPS is linked to the metering circuit. Keeping meter on will make sure the GPS data is ready when the shutter is pressed. The GP-1 will still periodically acquires GPS data even when camera or exposure meters are off as mentioned previously. If no GPS information is received for two seconds, no GPS data will be recorded. The recorded GPS data include latitude, longitude, altitude, and coordinated universal time (UTC). The UTC time is recorded independent of camera time. There is no heading information. You can connect GP-1 to a computer for use with mapping software and other applications using the USB cable supplied with your digital camera. Posted in Accessories, Photography Gadgets on January 20th, 2009. No Comments. Do you still remember the Lexar Shoot-n-Sync WiFi SD Card we talked about a while ago? It appeared to be just a Lexar-branded Eye-fi card. It turned out to be exactly the case. The Lexar even uses the same Eye-fi management software according to its support site. Back then I was curious about why Eye-fi has three flavors (Home, Share, and Explorer) but Lexar only has one. After reading the review by CrunchGear, I now know why: you simply choose to pay $15/year to add unlimited Geotagging. Another $15/year gives you the access to wi-fi hotspots managed by Wayport. Actually this is just like the customized service upgrades offered by Eye-fi. According to the review, the Lexar Shoot-n-Sync WiFi SD card only supports wireless uploading and sharing of jpeg files. It won’t do anything to a RAW file. If you are a RAW shooter, you can shoot RAW+JPEG, it will upload the JPEG but leave the RAW untouched on the SD card. It may be OK for casual usages but is quite limited for serious RAW shooters who can fill up 2GB in no time. Hopefully larger capacity versions and CompactFlash (CF) form factor will be available soon. Posted in Accessories, Photography Gadgets on December 10th, 2008. No Comments. Have you ever wondered why the memory card are becoming so cheap? Well, the NAND flash chips that go in those CF SD cards are in severe over-supply as the manufacturers such as Samsung, Hynix, Toshiba, Micron, etc continue to fight for market share. The average selling price (ASP) of NAND flash chips has declined 30% last quarter. This and the next quarter will be uglier for the chip manufacturers. Obviously the current global economic situation does not help either. We can expect the price trend to continue for a while, before some chip makers quit the market for good, or the solid-state drives (SSD) pick up the demand. Posted in Accessories, News, Photography Deals on December 3rd, 2008. No Comments. According to Nikon Japan, the GP-1 GPS unit has a suggested retail price of ¥21,000. Quick check using Google showed that it is about US $220 (subject to currency exchange rate variation). The price is similar to the US price we have seen. There still isn’t much official availability information yet. Someone on DPReview said it should be available before December 10th. Posted in Accessories, Photography Gadgets on November 30th, 2008. No Comments. 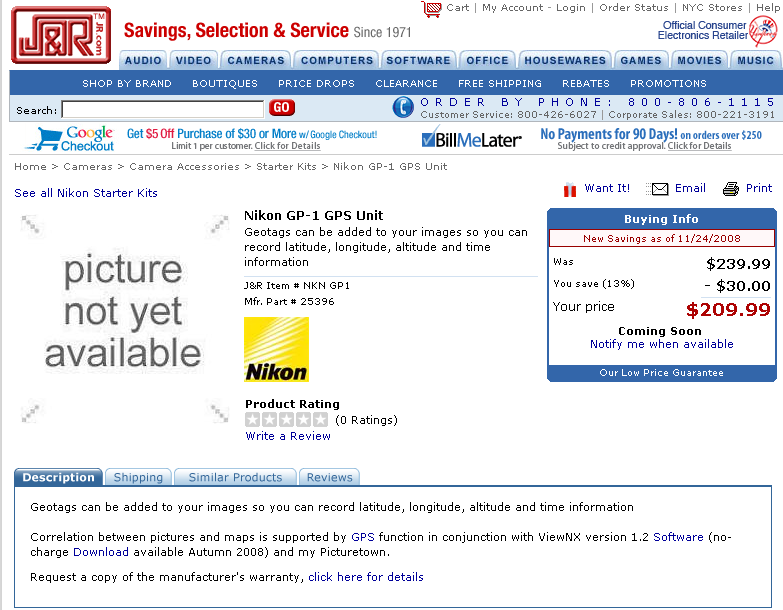 This is the first reported US price of the Nikon GP-1 GPS geotagging unit. J&R has it list for US $239.99 and $30.00 saving brings it to US $209.99 final. The price is consistent with the Canadian price of $275. You still pay a premium for a Nikon brand product but the price isn’t awfully hefty in comparison. 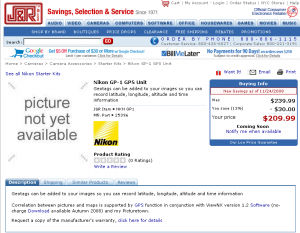 Update [November 26, 2008]: Same price at Adorama. Posted in Accessories, Photography Gadgets on November 26th, 2008. No Comments. Posted in Accessories, Photography Gadgets on November 19th, 2008. No Comments. Posted in Accessories, Photography Gadgets on November 6th, 2008. 1 Comment. The UV filter is supposed to block ultraviolet rays. This was perhaps important for shooting film but most today’s digital image sensors are not very sensitive to UV. Most of the UV is blocked by the glass in the lens anyway. So often these UV filters are recommended by people as a lens protection mechanism. Posted in Accessories on October 12th, 2008. 3 Comments.